Epcot, part of Walt Disney World in Florida, celebrates it’s 25th anniversary today. 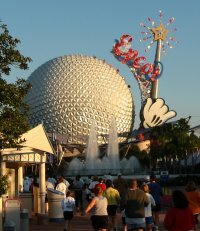 Here is a picture of Spaceship Earth (with the wand. 🙁 I’m not a big fan of the wand, which has now been taken down. Yeah!) from the 2003 Walt Disney World Family Fun Run. So in October 1982, when it opened, I would have been 11 and in sixth grade. Being that I was already a computer geek by then, I was fascinated by Epcot. There have been a lot of changes in the 25 years of the park, but I still like it. One of my favorite things is the food available in the World Showcase. I am partial to Les Chefs de France. (I like French cuisine. 🙂 ) I haven’t yet been to the Epcot resort area, which includes Disney’s BoardWalk Inn. (This resort has shops and restaurants in the boardwalk section and is in walking distance to Epcot. You can enter through the World Showcase entrance. But it is a deluxe resort, so I probably won’t be staying there any time too soon.) I haven’t been to the new and improved “The Seas with Nemo & Friends“. (It used to be called “The Living Seas”.) And Spaceship Earth is currently being updated (which is why the wand was taken down) and should be open by my next visit. So, even though it is 25 years old, there is still something new to do in the park.